Anyone who’s ever been frustrated at the task of shooting video in low light should be poised to freak out over Canon’s weird and amazing new camera. It’s a video camera that shoots full HD color footage in almost complete darkness. 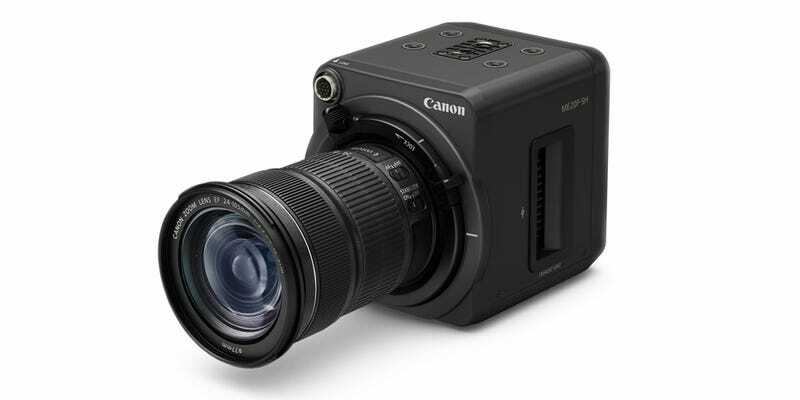 The ‘multi-purpose’ camera, dubbed only MH20F-SH, has a full-frame sensor with 2.26 megapixels. The reason for the meager resolution is because each pixel is very large—19 microns to be exact. That’s 7.5x larger than, say, the pixels found on a flagship DSLR like the Canon 1Dx. Huge pixels mean they can capture a huge amount of light. In this case, Canon’s sensor reaches an insane 4,000,000 ISO. Yeah, four million. Basically it sees better in the dark than you can. Remember, this is without infrared night vision tricks. It’s normal color 1080p video at 24, 30, or 60 fps. Before you get excited at what this means for your gritty neo-noir short film set in an dark alley, let me tell you that this camera is not meant for most consumers. First off, it’s $30,000. And it’s made for “industrial” uses. Not sure what that really means, but Canon mentioned things like nighttime surveillance and wildlife documentaries. Something tells me many crazies will think of other cool uses for it. It’s pretty small, at about 4 x 4 x 4 inches, so that will make it versatile for interesting shooting situations. The point of this seems to be for Canon to show off that it still innovates. It’s taken quite a lot of heat from camera enthusiasts in the past couple of years for falling behind in bringing new and forward-thinking features to market. Though proving people wrong with a $30,000 device is an interesting way to go. In any case, we can all look forward to eye-popping nighttime footage coming out of this thing in the near future when the camera ships in December.